I have just one Christmas wish that went unfulfilled this year. 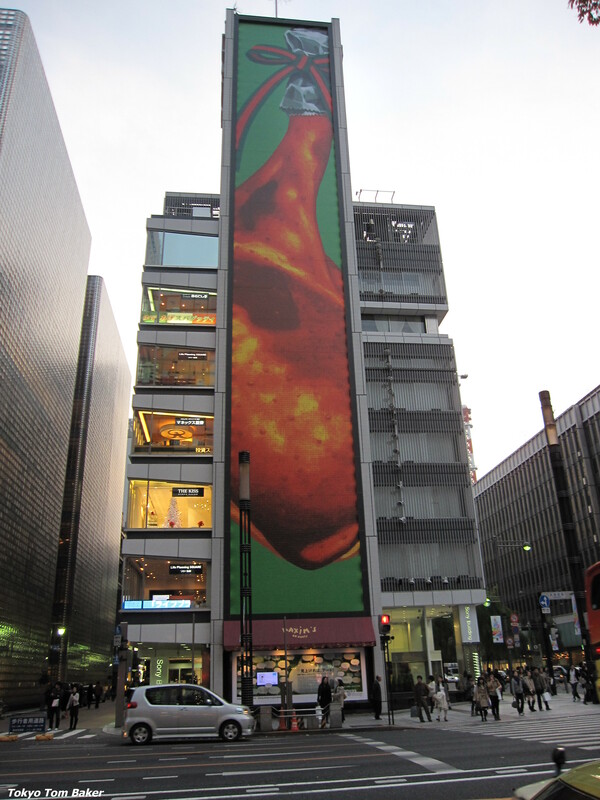 From Nov. 27 until Dec. 25, the towering façade of the Sony building in Ginza was decorated with a Godzillaesque roasted chicken leg. The image, titled “Roasted Chicken,” was the work of artist Yumiko Kanda. It replaced an earlier Kanda piece called “Banana” which I had liked a lot more. Alas, when I walked past the building a few nights ago, the “Roasted Chicken” was gone without a trace. As shown in the photo at the top of this entry, the Sony building has joined what my grandmother used to call the Clean Plate Club. Not all Japanese landscapes are beautiful in the same way. This one, which I shot with my cell phone last week in Misato, Saitama Prefecture, is tinged with sabi, the Japanese aesthetic sense of of loneliness, desolation, and picturesque decay. Or should I say wabi? “Japan: Profile of a Nation” notes that each word is “at times…used synonymously or in conjunction with” the other. It may help to remember that the kanji character for “sabi” is the root of the everday Japanese word “sabishii,” which means lonesome or lonley. To oversimplify, wabi is the beauty of simplicity, while sabi is the beauty of age. 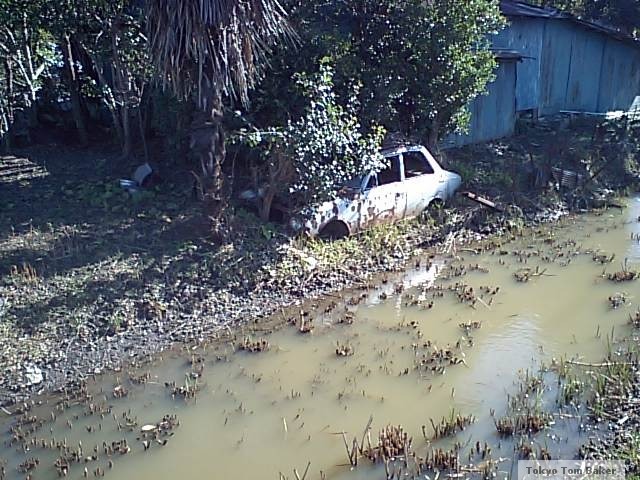 Thinking along the same lines, I would describe the rusted, half buried car in the photo above to be well toward the sabi end of the spectrum. The same goes for the haikyo ruins visited by people such as the blogger Gakuranman. These are slippery concepts that often overlap. It’s a real can of worms. But if pressed, I’d say that worms are sabi, too. It struck me as silly from the start. 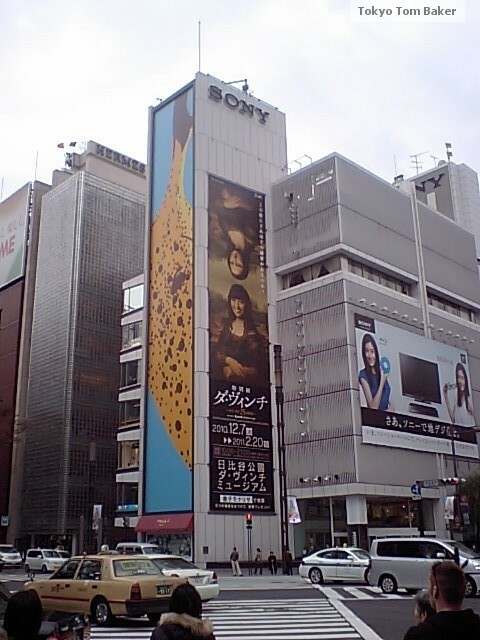 The tall, narrow façade of the Sony building, overlooking one of Ginza’s busiest intersections, had been adorned with a giant banana. But as I walked past it almost daily for several weeks, I gradually grew fond of it. And I was disappointed to see recently that it is no longer there. The Banana, which decorated the building from Oct. 28 to Nov. 26, was the work of 30-year-old artist Yumiko Kanda. 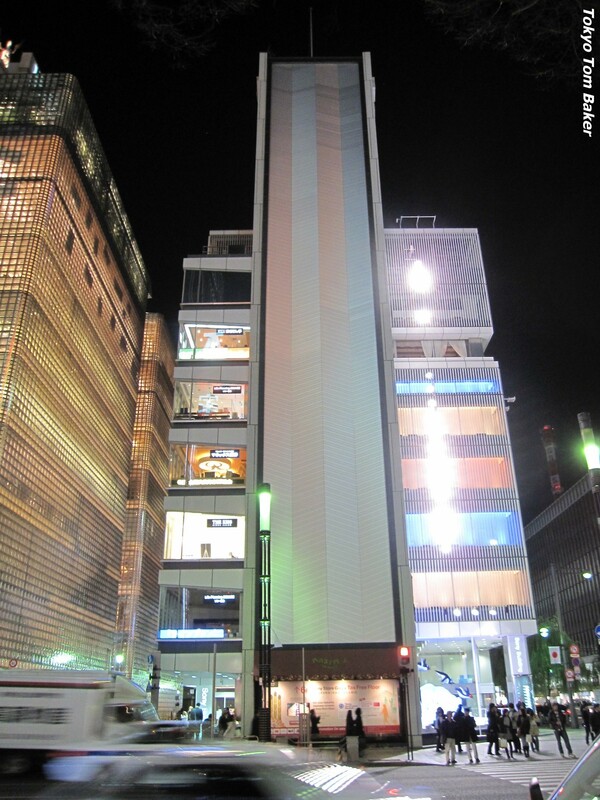 She was chosen for the job through a building-decorating contest Sony held. You can read about Kanda in Japanese, and see what the other finalists came up with, by visiting Sony’s Artwall page. Kanda’s Banana fit that “everyday” description. Rather than being an artificially perfect yellow, it is speckled with the black spots that tell you it is ripe and ready to eat. These spots appeared to remain static throughout the Banana’s run, but if it had been up to me I would have started out pure yellow and then added a bit of black every day, allowing the banana to ripen before the viewers’ eyes as the weeks went by. The spots could have been added discreetly at night, or perhaps Kanda (or a professional steeplejack) could have taken a bucket of black paint and used a rope to rappel onto various parts of the Banana in an ant costume in broad daylight. I don’t mean this as a negative criticism of the painting at all. The fact that I am having such thoughts means the Banana was a success. After all, if a 10-story Banana didn’t put silly ideas into at least some of its viewers’ heads – and smiles onto their faces – what would be its point? However, the smile was wiped from my face last week when I saw that my beloved Banana had been peeled off and replaced by another Yumiko Kanda work – a giant chicken leg. Perhaps Roasted Chicken will grow on me like Banana did. After all, they’re both pretty silly. But there’s cheerful silliness and there’s odd silliness, and Roasted Chicken falls into the latter category. It’s a well-known fact that bananas are more cheerful than chicken legs. Not even the coquettish addition of a red ribbon around the chicken’s ankle can change this reality. However, to admit my biases, I must say that my first glimpse of Roasted Chicken took place under less than ideal circumstances. 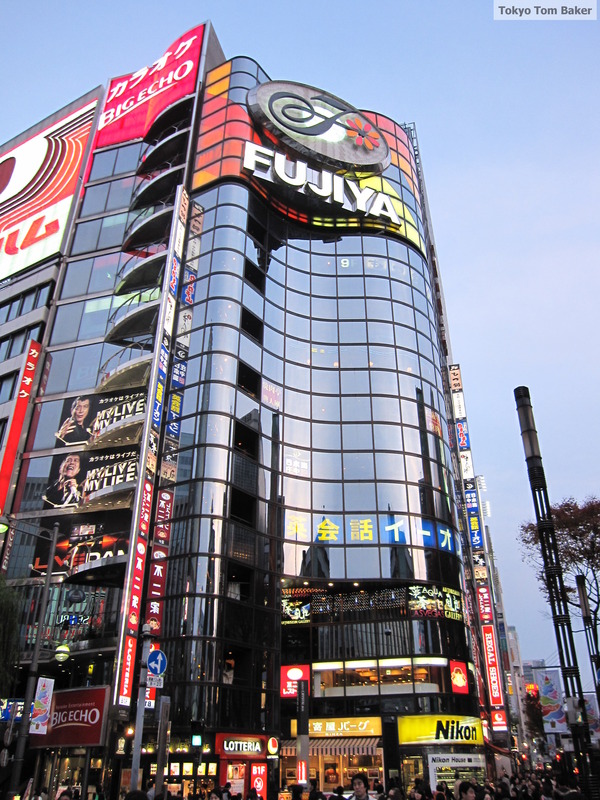 Not only did the loss of my cherished Banana have me in a state of shock, but the low winter sun was reflecting off the wavy glass front of the Fujiya building across the street from the Sony building in such a way that it splashed large, uneven patches of light across the Roasted Chicken. This gave the chicken’s skin an unhealthy mottled appearance, as if it had been unevenly cooked. It was a most unappetizing spectacle. When viewed in a better light (literally), Roasted Chicken actually doesn’t look horrible, but it still doesn’t make me smile the way Banana did. 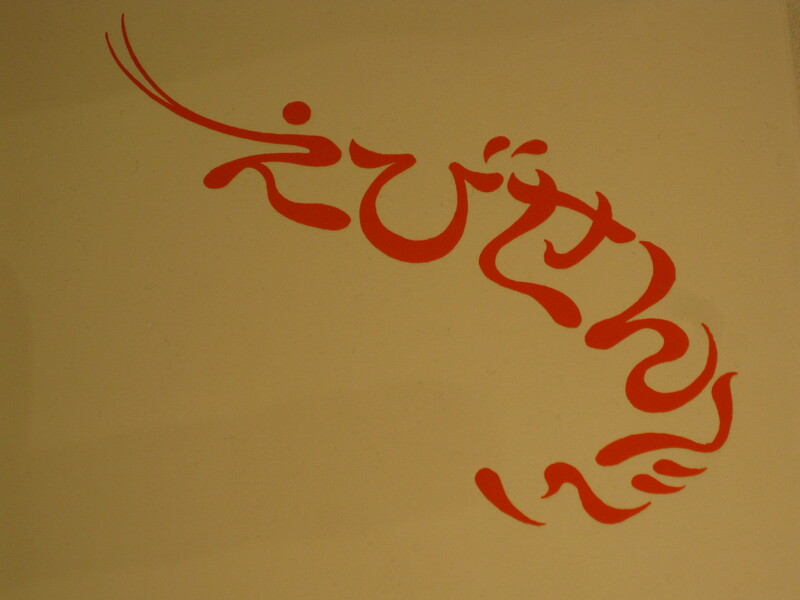 A third Yumiko Kanda painting will go up on the Artwall in summer 2011. I happened to be at the Tokyo Midtown complex in Roppongi a few days ago, and I decided to have a look at the 2010 Good Design Awards show at the Design Hub facility. 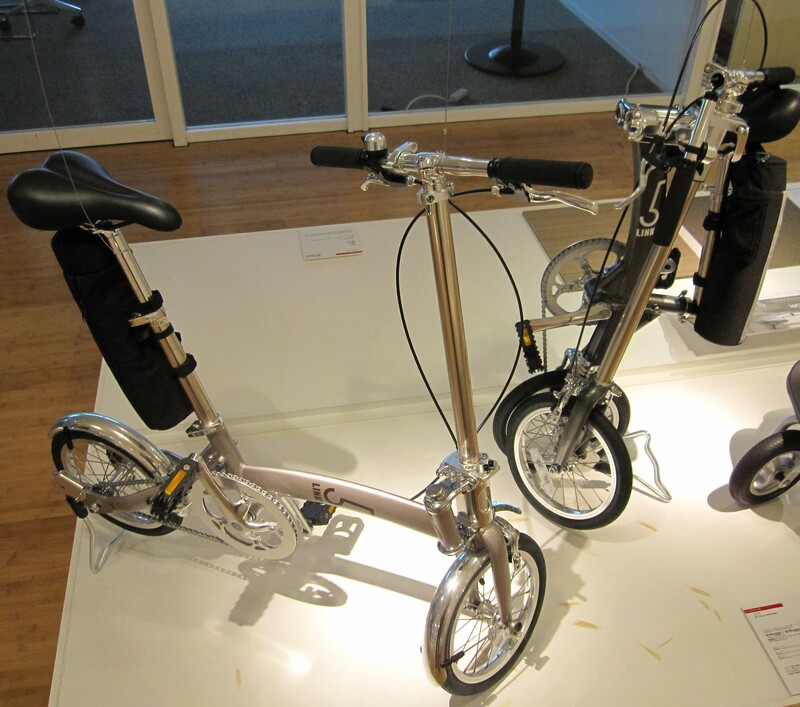 The awards are given by the Japan Industrial Design Promotion Organization (JIDPO). The show runs through Dec. 5, and admission is free. Two of the most interesting items on display were air-moving fans from opposite ends of the technological spectrum. 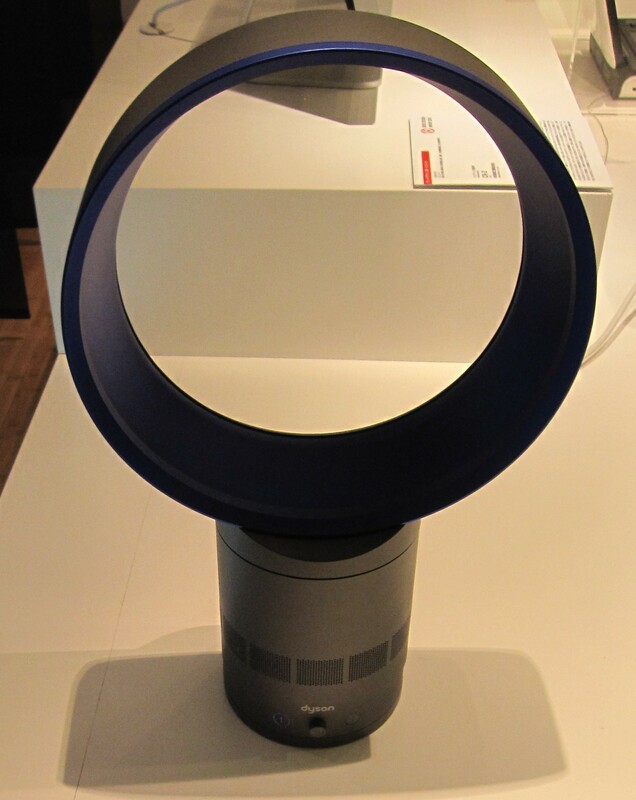 One of these was the Dyson Air Multiplier, a bladeless fan shaped like a hoop. It seemed to be turned on at a low setting in the display area, but there was a definite breeze emanating from it. It had no visibly moving parts. Standing in front of it, I did what anyone would be tempted to do. I slowly moved my hand toward the hoop. I hoped I might feel something that would help me understand how this strange device worked. But I wasn’t entirely convinced that what I was doing was safe, so I was ready to jerk my hand back in a split second if something went wrong. Weirdly enough, the breeze rapidly weakened as my hand got closer to the hoop. And with my hand inside the hoop, I COULDN’T FEEL ANY AIR MOVING AT ALL. This didn’t help me understand the device; it only made it more bizarre. Air is sucked into the base of the device by an impeller and is then forced out through a tiny slit running around the rear inner edge of the hoop. This slit is so small that I hadn’t even noticed it. The hoop itself is designed like a rolled-up airplane wing. As air passes over a wing, it creates a low-pressure zone that contributes to lift. In the case of the air multiplier, this low-pressure zone pulls in surrounding air that “multiplies” the breeze. But that action takes place around the edges and in front of the device, which is why the air in the center of the hoop hardly moves at all. It’s terribly clever, but I question whether it is necessary. If I were marketing this device, I would first emphasize that uses less energy than a conventional fan. (This is a green virtue rather than a frugal one, because the fans cost 37,000 yen to 54,000 yen on Dyson’s Japan site, and $299.99-$449.99 on the U.S. site.) Then I’d point out that its bladelessness makes it safer to have around kids. Sorry, Dyson, but the breeze from a conventional fan is more than gentle enough for me. The only time I ever noticed the air being “chopped up” was when I was about 8 years old and used to put my face right up to a fan and talk into it. The vibrating air made my voice sound funny, which I greatly enjoyed at the time. A Dyson air multiplier would have deprived me of that childhood pleasure. 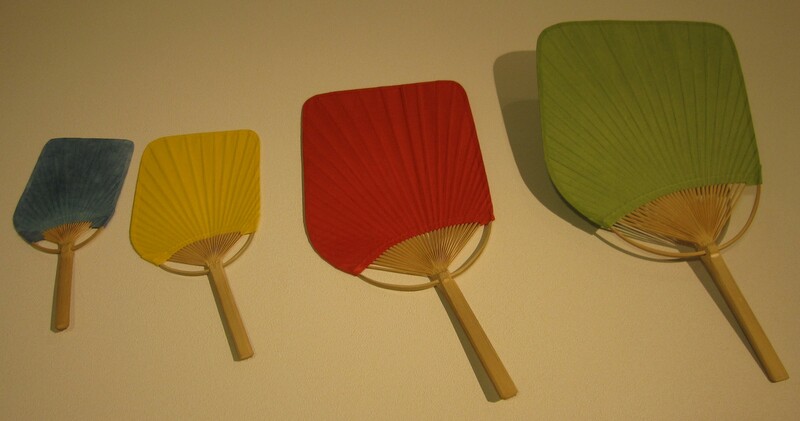 A Good Design Award-winning fan at the opposite end of the technology spectrum was designed by “DesignStudio Megane” and “Uchiwa Studio Mitani.” A traditional uchiwa fan is made with a piece of bamboo that is split into strips along one half of its length. 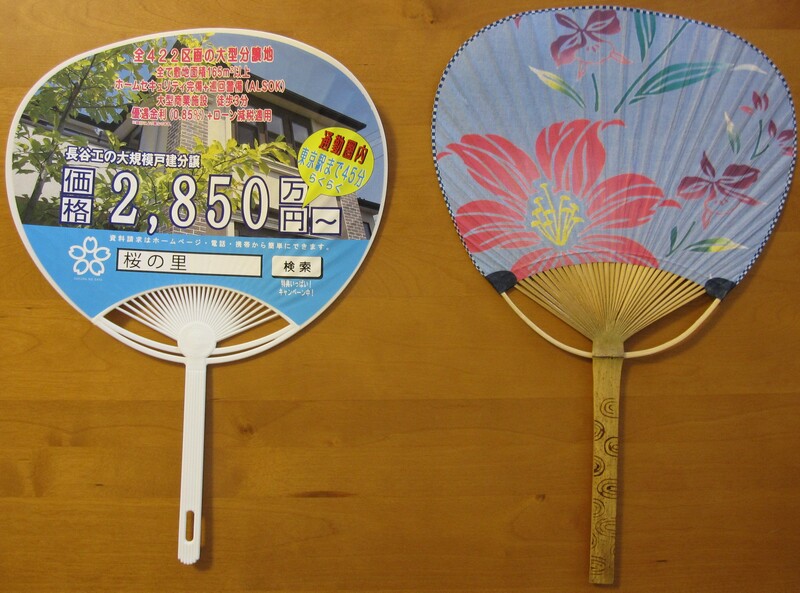 The strips are fanned out, a roundish piece of paper is pasted over them, and voila – you have a fan. As you can see from the photos below, plastic usually replaces the bamboo these days. 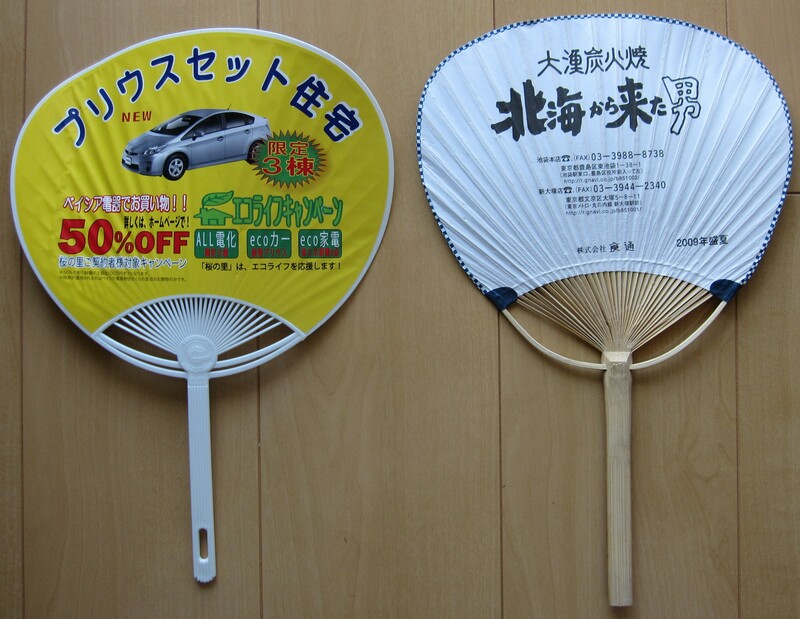 The design innovation that won an award for the Megane and Mitani studios is that their uchiwa are rectangular rather than roundish. With the Dyson air multiplier fresh in my mind, I thought this was to ensure that the effort of the user’s arm muscles would be focused exclusively on moving air in the direction of their own face, rather than out to the sides. However, I was wrong. What the designers really wanted to do was create an uchiwa that people would keep for a longer time because it could fit neatly among the newspapers, books or magazines they might be carrying anyway. Another item that caught my eye was this folding bicycle by Five Links. 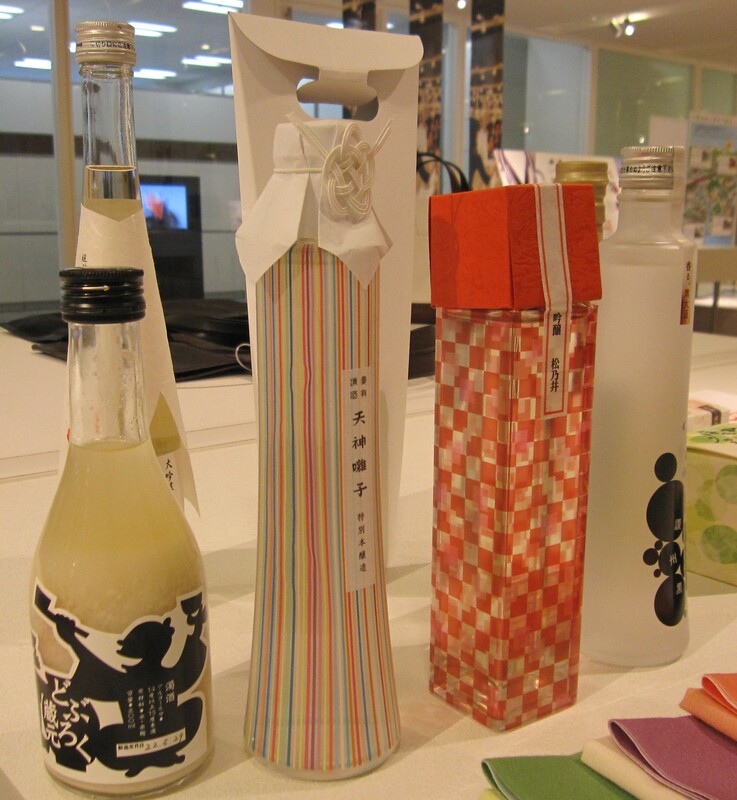 Other winning items at the show included a collection of labels for local food and beverage products. My favorite among these was a box of ebi-sembei (shrimp-flavored rice crackers) that spelled out the word “ebi-sembei” in hiragana so that it looks like a shrimp. For more info on the awards, click here. For more info on Design Hub, click here. You are currently browsing the Tokyo Tom Baker: The Blog blog archives for December, 2010.